It’s been a while now since I came home from Sweden after doing some chocolate courses there. I came home full of confidence and excited to make some chocolates all by myself at home, however there were lots of chocolates to eat first so we had to spend almost three weeks eating those, which wasn’t much of a chore. I spent a good deal of time trying to find a chocolate scraper to scrape the chocolate off the moulds and to use when tabling the chocolate, but it was quite difficult to find one. I didn’t fancy making a big order just yet for chocolate supplies and couverture chocolate when I still had 4.5 kilograms to use because I didn’t want any chocolate to go old. The other option I had was to buy one intended for various handy-man tasks, so I looked around and finally managed to find a stainless steel one for 6.5 pounds. It’s not great; the blade is too wide (not wide as in the widest part, but wide on the short end if that makes sense? ), and this means that it’s a little bit more out of control because it’s a bit too flexible. However, it works and that will do for now. It arrived last weeks and I said to Keith that this weekend when we’re both free we will make some chocolates. I didn’t want to make anything too advanced that could go wrong and would put me off so I just settled on a ganache filling with amaretto filled with a quarter of a cherry soaked in kirsch (a quarter of a cherry because they were huge). I’m not sure how the cherries affects the shelf life, but the standard 2-3 weeks should apply. Not that they will last that long; Keith seems to like them. I was actually quite nervous, because I know how easy it is for the chocolate to go out of temper; one degree can ruin it and you have to start over again. But we set to work on Friday evening. We gathered all our tools and ingredients in the kitchen that kindly had been warmed up to a suitable temperature and set to work. I used some leftover plantain couverture from Michelle Cluizel that was quite fruity and tangy and decided to use some 60% dark chocolate from Chocovic for the shells that to me tasted very sweet and fruity that I thought would complement the filling. Making the ganache proved to be no problems, so we put it in a piping bag to cool down and started on the shells. This involved chopping lots of chocolate because my chocolate was in the form of blocks. After about 20 minutes we started the tempering process, at the last stage when you’re reheating the chocolate we heated it about one and half a degree too much so we had to start over. We filled the mould, shook it to get rid of air bubbles and put it up side down to set. After a few minutes I scraped it again and we filled it, then I put it in another room so that the ganache could crystallize overnight. And we cleaned the kitchen free of chocolate. The morning after I was quite nervous, again. Today we had to cap the chocolate, and if you’re a perfectionist that’s the hardest bit. We tempered the chocolate again and this time it went fine, and then I poured it over the mould and scraped it off. I got some small holes here and there but it looked nothing like the disaster bottoms that I capped at Chokladskolan, I simply filled them by putting some chocolate on my fingers and then I let them sit for 15 minutes and then put them in the fridge for another 15 minutes to release latent heat. During this time we cleaned like mad, again, because chocolate is messy. I carefully flipped the mould upside down and the chocolates fell out. They were pretty, but some had a few tiny streaks, so I went through it all in my head, trying to figure out what went wrong. I checked Greweling’s book and the chocolate might be undertempered, as in not enough form five crystals. The temperature were right when we tempered it so I figured that I have to agitate the chocolate more next time I temper, because agitation helps seed the chocolate. However, the streaks were only on some chocolates and they were tiny. Apart from the streaks the chocolates were incredibly shiny and they had a great snap so I figured I got it almost right. And the bottoms? They are a bit bumpy and you can see where the walls from the shells are but they are much smoother than my previous attempts so I’m not too sad about it. I just need more practice. Greweling says in his book that it helps to heat the chocolate shells with a heat gun (or for you and me, a hairdryer might work) slightly before capping but I don’t want to experiment with that just yet because if you heat the chocolate too much it goes out of temper. 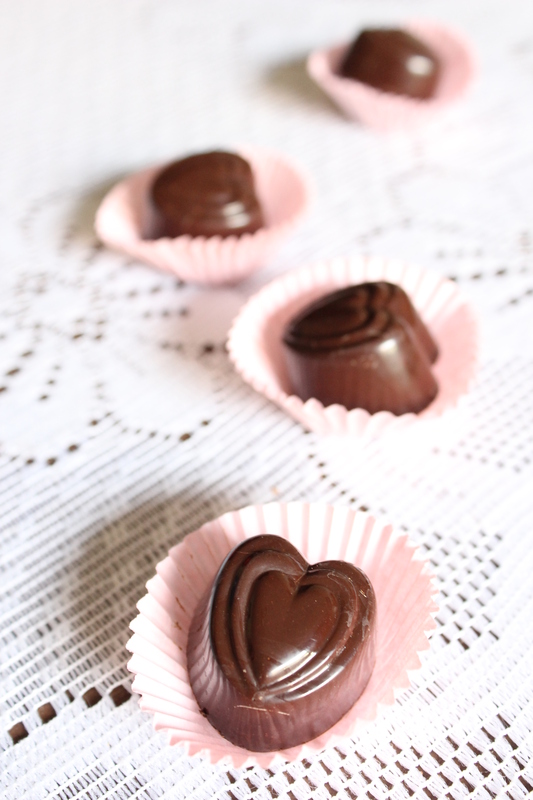 This recipe makes 20-24 chocolates depending on the mould you’re using. You’ll need about 400 grammes of couverture chocolate for the chocolate shells. Chop the chocolate finely. Bring the cream to the boil and pour it over the chocolate and let it sit for one minute. Start stirring the chocolate, starting from the middle and going outwards, stir it until it’s smooth and free of lumps. Add the soft butter and stir until it’s incorporated, then add the amaretto and stir. Transfer to a piping bag and let it cool while you make the chocolate shells. Temper the chocolate and mould the shells as usual. Take the cherries and either quarter or half them to make one piece per chocolate (the mould I used made 24 chocolates). By now the ganache should be cold enough, pipe a tiny blob into each cavity so that the cherries have something to stick to. Fill the rest of the cavity with more ganache, leaving some space for the cap. Let it sit overnight to crystallize. Temper the chocolate again the day after and cap the chocolates as usual. This entry was posted in Chocolate and tagged amaretto, cherry, chocolate, tempering. Bookmark the permalink.